The M549A1 Rocket Assisted Projectile was developed to provide extended range for standard and developmental howitzers. 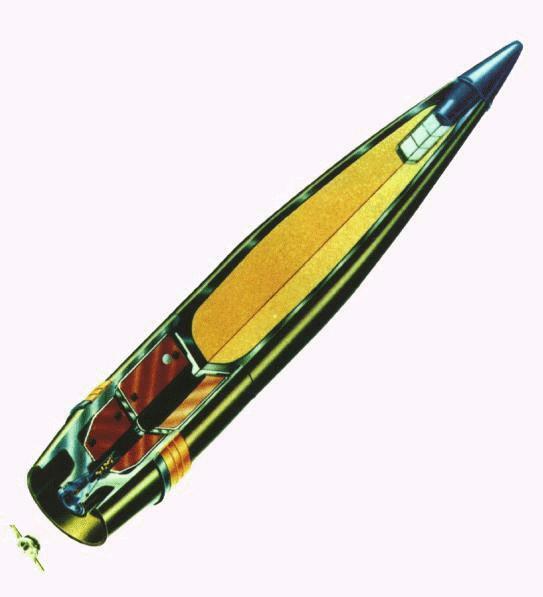 The projectile has two distinctive preassembled components--the high explosive warhead and the rocket motor. The warhead is fabricated from high fragmentation steel for increased effectiveness and contains a bulk-filled explosive. Currently there are two models. The M549 contains 16 pounds of Composition B and is restricted from use with the new top Zone 8S M203 Propelling Charge. To assure compliance with safety requirements in newer weapon systems, which are capable of using the M203 Propelling Charge, a conversion to TNT fill in lieu of Composition B was introduced in September 1977 with Type Classification of the M549A1. The M549A1 contains about 15 pounds of TNT.